It's already Friday! Why don't you try to register this promo of Talk N Text! 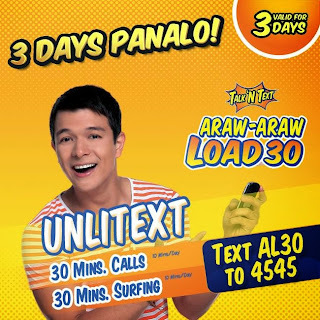 New from Talk N Text, for three days, you can have unlimited texts plus 30 minutes calls to Smart and TNT friends valid for 3 days (10minutes are allowed for day). Not just that, you are also allowed to surf the net and connect with your friends in FB or Twitter for 10 minutes each day. Your weekends is not that "BORING" anymore, because you can now text your friends, call them and even browse the net! After receiving, enjoy your 3-day unlimited texts! You are just allowed to use the call for only 10minutes each day. Same with the internet surfing, 10minutes allowed for 1 day.